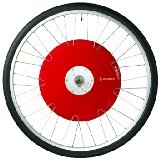 Copenhagen Wheel transforms your bicycle into a smart electric hybrid, quickly and easily. Break the cycle (no pun intended) of failure in 2018. Did you know that 80% of resolutions fail by the second week of February? Sound familiar?